We are witnessing an increased number of unexpected political and economic evolutions, of crises and conflicts, of hot spots on the geopolitical map – see the hybrid war in Eastern Ukraine, on the Euro-Atlantic frontier, the actions of ISIL and the changing nature of conflict and the dramatic follow-up of the so-called Arab Spring, the wars in Libya, Syria or Yemen and moreover China’s new status as being “on the rise”, its assertively in South and East China Seas, etc. – which are all part of the new political and strategic landscape at the beginning of the XXI Century. These events happen in a stage of transition to a new cycle of systemic power/towards a new strategic environment which means that we are facing a redistribution of power, are designing of the geopolitical map. The aim of this paper is to analyse the strategic environment at the beginning of the XXI Century, to assess the impact of the main emerging security challenges on the configuration of the new cycle of power with a focus on Asia-Pacific and the strategic relationship between the USA and China. The aftermath of the Vilnius Summit raised many questions regarding the effectiveness of the European foreign policy in the Eastern partnership countries. The previous incidents show the imperious need of a security dimension for the Eastern Partnership. A new European security system is required to offer better solutions to a region that struggles with the annexation of Crimea, violent conflicts in the Donbas area in Eastern Ukraine, the 2008 Georgian-Russian war and the five frozen conflicts at the Eastern frontier of the EU. In this paper, I will present from a macro-level analysis the main transformations and challenges of the Eastern Partnership after the Vilnius Summit until the Riga Summit, elaborate on the expectations from the upcoming Riga Summit and its importance in the actual context and offer some insights in the main reasons why controlling the Eastern neighbourhood is important for both European and Russian security. Modern conflicts are defined in terms of technological development and innovation. Cyclically, the emergence of new technology propels society towards progress. Launching the personal computer in 1974, development of the World Wide Web and later, of the mobile technology are examples not of mere business innovations, but of values which determined change in matters of mental, relational and behavioural patterns on a macro level. The existing brands grant the illusion of power-holding to the population. If the contestations of political regimes in the Middle East, organized through social media platforms, proved that the Internet and especially the social networking sites are democratic instruments, used for expressing the will of the people, in what regards the binomial relationship social networking and Russian Federation, we maintain scepticism. The international security environment, as it is foreshadowed in the present, can be defined in terms of conflict and uncertainty. For Europe, one of the biggest challenges, security-wise, was and is the Ukrainian crisis. During the military crisis, the Russian Federation used on a large scale the media instruments to create ostensibly the legitimacy of its actions. Starting from simple scenarios, portraying the fight between good and evil, Kremlin perfected in time its propaganda means and symbolism. The article focuses on how the Russian propaganda works more than on what it conveys and addresses the issue of recent developments in technology and software and how they were used as incubators for propaganda. This paper is a critical view on the constitutional dynamics in the Romanian public space, reviewing the constitutions from 1866 until now, with a particular outlook on the present constitution, the one from 1991, revised in 2003. Every text has had a short life and a lot of amendments, a fact worthy of our reflection. Starting from the hypothesis that every constitutional text is an answer to a determinate fear, or at least to certain concerns and desires specific to the historical moment, I have explored the weaknesses and gaps or deficiencies capable of explaining public behaviour, public constitutional discourse and Romanian constitutional alternatives as answers to these issues. In this context, some features will be analysed such as the ambivalence of tendencies, the continuous oscillation to the opposite poles, the recurrence of representations, etc. Amid all these antinomies and paradoxes, Romanians should find a proper way to behave in the constitutional space, even by rethinking democratic values in the light of national needs and in a context where modernization and Europeanization are important aims for us to achieve. Romania’s role conception is depicted in the series of national security and defence strategies formulated during its post-communist era. These strategic documents represent the vision of the country’s Presidential Administration regarding foreign and security policy’s main directions and, if adopted by Parliament, the national vision on foreign and security policy. The purpose of this study is to provide an analysis of Romania’s role conception through the comparative case study of three of these national strategies, showing that while the stages of transition undergone by Romania in terms of foreign and security policy have had in some respects a manifold impact upon its security discourse and its strategic culture, some elements of strategic culture have remained constant despite important external shocks. Romania has maintained its role conception as a balancer in the region and its security rationale focused on Russia. The integration into the Euro-Atlantic community has led, on the other side, to an accentuated and constant Atlanticism as a main feature of Romanian security policy, as well as to a newly found assertiveness. However, this (re)discovered assertiveness has not led to consensus in terms of foreign and policy prioritisation, but to a current foreign policy based on the search for a new paradigm. The paper evaluates costs and benefits related to the transformation of the Czech economy. As an alternative approach to the frequently used accounting-based view, a macroeconomic method is utilized which identifies costs and benefits of the transformation in its impact on the domestic product growth rate. The analysis itself follows econometric estimates of relationships between the growth rate of an economy and an occurrence of a transition reform. These estimates, which are gathered from the relevant literature, are then applied to the Czech case, which allows obtaining explicit values of costs and benefits related to the transformation process. Results show that, in the short run, the transformation brought costs of hundreds billion Czech Koruna (CZK), measured in the 2005 price level. The total costs are estimated in the range 3300-3400 billion CZK. Nevertheless, the total result of the economic transformation is found to be positive – especially a quick external liberalization of the country reveals to be the most beneficial aspect of the transformation. Contrary, the largest costs are related to the large-scale privatization and the financial sector reforms. Czech Republic; Economic Transition; Liberalization; Privatization. 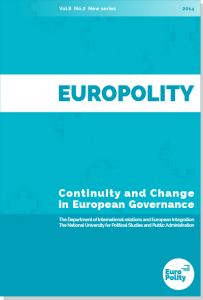 In this paper I refer to the bidirectional relationship between the Europeanization process and the emergence of an evaluation culture in Europe. I examine both the factors associated with the Europeanization process that led to the crystallization of an evaluation culture as well as the manner in which the development of a European evaluation culture lead to a deepening of Europeanization through the institutional mechanisms that have been created. I will then present the convergent influence of Europeanization and globalization, which renders the theme of the net impact of any of the two processes on the formation of an evaluation culture methodologically unapproachable, but brings to the fore the theme of intercontinental factors (mainly North Americans) that play a fundamental role in creating a European public evaluation agenda. Given the multiple influences and pressures exerted both vertically and horizontally, I question the very existence of a specific European culture of evaluation and I ultimately position its nature as being somewhere between imitationalism and syncretism. After the collapse of Communism in Central and Easter-European countries, women, with less political and symbolic resources, organized themselves outside the political parties in various NGOs, so to persuade politicians to vote for laws against discrimination, domestic violence and for gender equality, and to influence equal opportunity policies and the democratization process. After more than two decades of economic, social and cultural transition, I analyse how women and gender based NGOs have been affected by external financial aid (European, Swiss and Norwegian) that generally supported their actions. The aim of this research is to understand to what extent and with what effects were these social funds implemented in Romania and Poland. In this regard, this article deals with the theoretical assumptions of sociological institutionalism, which suggest that the more NGOs are dependent on financial resources provided through targeted programs, the more they become isomorphic in their organizational structure. Distinctions are made in relation to NGOs and the civil society sector, so to provide an operational definition of non-governmental organizations and why these organizations are susceptible to change. The pressures that this sector encounters are further presented, in relation to the two countries under analysis so as to highlight both the similarities and the differences between these organizations and identify further directions of analysis. The initiation in Warsaw of the CEE-China cooperation (so called 16+1 format) in 2012 has aroused many hopes in participating countries, since many of them were cash-strapped after the global financial crisis and China offered credit lines as well as know-how in infrastructure building. At the beginning, Poland viewed 16+1 as a useful platform to prove its growing diplomatic clout in CEE because China claimed that Poland is a natural and real leader of the 16+1. As the 16+1 cooperation matured this format quickly showed a major drawback – China uses the diversity among the 16 CEE countries (e.g. EU and non-EU status) to promote its own interests (divide et impera). The Chinese strategy turned out to be particularly at odds with Polish foreign policy goals, since from Warsaw’s point of view the unity of the EU at all fronts in the face of Russian aggression on Ukraine is of the utmost necessity. Moreover Polish diplomacy is becoming more and more sceptical of 16+1 because of the EU’s pressure to toe the line of EU framework of cooperation with China. The absence of Polish PM Ewa Kopacz at the 16+1 Belgrade Summit in December 2014 may result in a change of Chinese attitude towards 16+1. BOOK REVIEW: WE LIVE IN TWENTY-FIRST CENTURY AND THERE IS STILL NO PROLETARIAN REVOLUTION. DID CAPITALISM CHANGE ITS FACE? Thomas Piketty. 2014. Capital in the Twenty-First Century. London: Harvard University Press, 685p. ISBN 978- 0- 674- 43000- 6. Alexander Dugin. 2015. Last War of the World-Island: The Geopolitics of Contemporary Russia, Arktos Media Ltd., 166p, ISBN: 978-1-910524-40-4. Dorin Dolghi and Octavian Țâcu (editors). 2014. The Security Dimension of European Frontier vs the Legitimacy of Political Priorities of EU and EU Member States. Eurolimes. Journal of the Institute for Euroregional Studies ”Jean Monnet” European Centre for Excellence, University of Oradea, University of Debrecen, volume 18, autumn, Oradea University Press, 235p, ISSN 2247/8450.